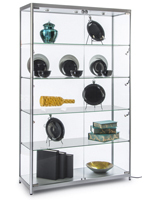 This Glass Trophy Case With Four Shelves Is Perfect For Providing A 360 Degree View Of The Items Inside! These Display Cabinets Are Big Enough to Support A Massive Amount Of Trophies, Awards, and Other Goods! Crafted from 6mm tempered glass for safety! 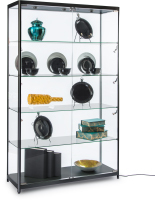 Glass cabinet features sliding, locking doors for protection of goods! Removable shelves for your convenience! 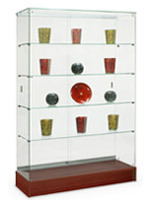 This maple finish retail showcase, trophy case is extra large, measuring 48" wide and 18" deep. This is large enough to accommodate various product lines and collectibles. 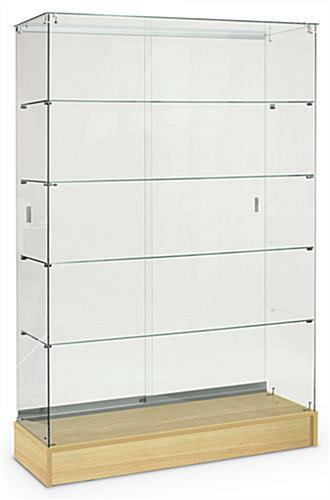 The versatile trophy case features four (4) fixed-height shelves, all of which are removable for displaying taller merchandise. 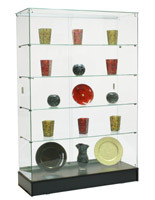 This modern showcase is constructed from resilient, safety glass, offering a sturdy display. This type of construction is much less likely to break than traditional display cabinets, and if it does, it will produce small, manageable fragments rather than large, dangerous shards. A maple-finish, melamine base adds subtle warmth. Sliding doors feature a key lock for the security of merchandise in the trophy cases. These showcases ship knocked down, significantly lowering shipping costs. Setting up the cabinets is simple, but does require at least two people. 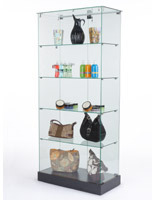 This trophy case showcases products in retail environments. They are designed to draw attention to popular, expensive, or even slow-selling merchandise. 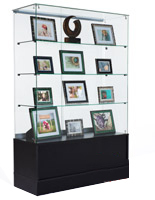 The trophy case, also known as a glass pedestal, keeps jewelry, antiques, souvenirs, electronics, and collector's items safe. 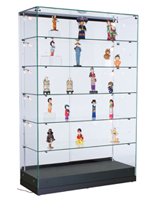 Retail stores, museums, boutiques, gift shops, jewelry stores, hospitals, and universities will find these showcases to be a great asset. 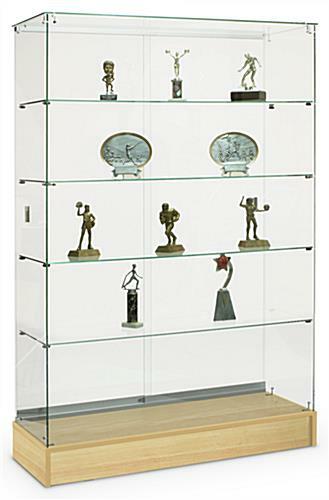 Each trophy case adds a stylish, modern element to any environment with their frameless design. Businesses and theater lobbies, a Hall of Fame, or stadiums can fill the display cabinets with corporate or sports memorabilia, past playbills, costumes, and other keepsakes. Local schools often showcase student artwork, awards, trophies, and artifacts within a trophy case like this one. They are effective and affordable showcasing solutions. Please Note: We are offering this fixture with Dock to Dock shipping only.